‘‘To Da-duh, in Memoriam’’ is an autobiographical story told from the point of view of an adult looking back on a childhood memory. The story opens as the nine-year-old narrator, along with her mother and sister, disembarks from a boat that has brought them to Bridgetown, Barbados. It is 1937, and the family has come to visit from their home in Brooklyn, leaving behind the father, who believed it was a waste of money to take the trip. The narrator’s mother first left Barbados fifteen years ago, and the narrator has never met her grandmother, Da-duh. Although an old woman, the narrator’s grandmother is lively and sharp. When she meets her grandchildren, Da-duh examines them. She calls the narrator’s older sister ‘‘lucky,’’ but she silently looks at the narrator, calling the child ‘‘fierce.’’ She takes the narrator by the hand and leads the family outside where the rest of the relatives are waiting. The family gets in the truck that takes them through Bridgetown and back to Da-duh’s home in St. Thomas. To Da-duh in Memoriam | Author Biography Marshall was born on April 9, 1929, in Brooklyn, New York, the child of Barbadian immigrants who were among the first wave of Caribbean islanders to relocate to the United States. Her early life was suffused with Caribbean culture; she spoke its language and followed many of its traditions. Marshall made her first visit to the Caribbean when she was nine years old, which inspired her to write poetry. “Nothing endures but change” (Heraclitus 540-480 BC). People are born, only to die again. In a never-ending cycle of life and death, new ideas replace older ones and an evolution of perspectives takes place. Paule Marshall aptly portrays this cyclical nature through her last line “she died and I lived” referring to her grandmother. The death is not physical alone. It is the death of old ideologies, dated traditions and disparate acceptance of modernization. In a vivid recollection of her grandmother Da-Duh’s reluctance to accept change during Paule’s childhood visit, she narrates how the old lady loathes urbanity and finds delectation in her little island of natural beauty. The interactions that the narrator has with her grandmother remind us of the passage of time between generations. The demise of Da-Duh signifies the change that is inevitable, the transition from the old to the new. Paule Marshall’s work is replete with a richness of literary devices like symbolism, imagery and metaphors. Describing the foreboding character of death, the narrator feels that the planes that bring death to the little village are “swooping and screaming…monstrous birds”. The sugarcanes that grow in the village are Da-Duh’s delight and also the reason for the exploitation in the village. The pride of Da-Duh, the sugarcanes appear threatening to the narrator she feels that the canes are “clashing like swords above my cowering head”. This is a description of the duality of life. Where there is joy, there is pain and when there is life, death is bound to follow. The life-death antithesis is depicted in the closing lines of the book where the narrator paints “seas of sugar-cane and huge swirling Van Gogh suns and palm trees [in] a tropical landscape . . .while the thunderous tread of the machines downstairs jarred the floor beneath my easel.’’ Light is identified by the surrounding darkness and life, by death that eventually follows. The transient nature of life is evidenced by the changes that happen over a period of time. With a judicious use of metaphors, the narrator has drawn us to the reality of inevitable changes that our lives are subject to. Again, the sugarcanes are metaphorically perceived as the ominous danger that “…would close in on us and run us through with their stiletto blades.” Later, the planes that cause the death of her grandmother are visualized by the narrator as “the hardback beetles which hurled themselves with suicidal force against the walls of the house at night.” She points at our dogmatism in accepting the fact that the world is constantly changing. Those who fail to see this at first, experience it the hard way later. 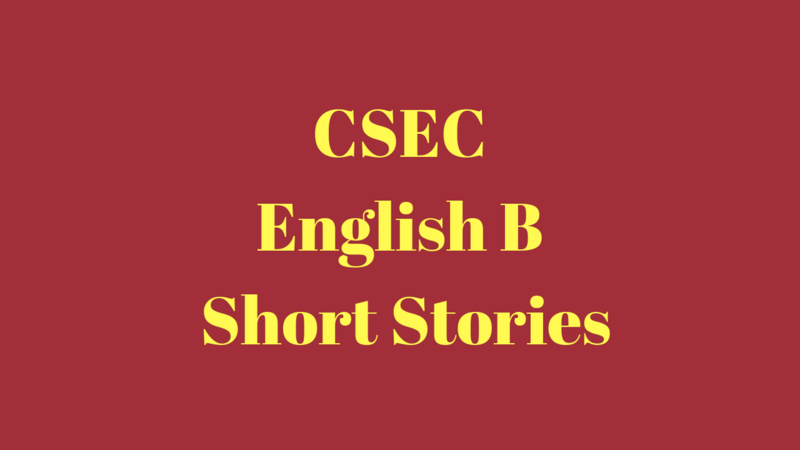 This short story is about a young girl’s visit, from New York, to the island of Barbados. The protagonist, along with her sister and mother, visit Dah-Duh. The visit is an interesting one in which Dah-Duh and the protagonist develop a caring, yet competitive, relationship. Dah-Duh introduces her to the riches of Barbados (nature), while the protagonist introduces her grandmother to the steel and concrete world of New York (industrialism). There is a competitive edge to their conversations because they each try to outdo each other on the merits of their separate homes. Dah-Duh, however, is dealt a blow when she learns of the existence of the Empire State building, which was many stories taller than the highest thing she had ever laid her eyes on – Bissex Hill. She lost a little bit of her spark that day and was not given a chance to rebound because the protagonist left for New York shortly after. The story progresses with the death of Dah-Duh during the famous ’37 strike. She had refused to leave her home and was later found dead, on a Berbice chair, by her window. The protagonist spent a brief period in penance, living as an artist and painting landscapes that were reminiscent of Barbados. The story is set in Barbados, in the 1930’s. A small and purposeful old woman. Had a painfully erect figure. Over eighty (80) years old. She moved quickly at all times. She had a very unattractive face, which was ‘stark and fleshless as a death mask’ (Marshall, p.178). Her eyes were alive with life. Had a special relationship with the protagonist. Had a special relationship with Dah-Duh. This theme is apparent when Dah-Duh and the protagonist discuss the fact that she ‘beat up a white girl’ in her class. Dah-Duh is quiet shocked at this and exclaims that the world has changed so much that she cannot recognize it. This highlights their contrasting experiences of race. Dah-Duh’s experience of race relations is viewing the white ‘massa’ as superior, as well as viewing all things white as best. This is corroborated at the beginning of the story when it was revealed that Dah-Duh liked her grandchildren to be white, and in fact had grandchildren from the illegitimate children of white estate managers. Therefore, a white person was some-one to be respected, while for the protagonist, white people were an integral part of her world, and she viewed herself as their equal. This story highlights the strong familial ties that exists among people of the Caribbean, both in the islands and abroad (diaspora). The fact that the persona and her family left New York to visit the matriarch of the family, in Barbados, highlights this tie. The respect accorded to Dah-Duh by the mother also shows her place, or status, in the family. The protagonist states that in the presence of Dah-Duh, her formidable mother became a child again. This is a minor theme in this short story. It is highlighted when it is mentioned that Dah-Duh liked her grandchildren to be boys. This is ironic because the qualities that are stereotypically found in boys – assertive, strong willed, competitive – are found in her grand daughter. An example of this is the manner in which the protagonist / narrator was able to win the staring match when she first met Dah-Duh, this proved her dominance and strength. This building represents power and progress. It is in the midst of the cold glass and steel of New York city and, therefore, deforms Dah-Duh’s symbol of power; Bissex Hill. It is not by accident that the knowledge of this building shakes Dah-Duh’s confidence. Steel and iron, the symbol of progress, is what shakes the nature loving Dah-Duh. It can, therefore, be said that her response to the knowledge of the existence of the Empire State Building – defeat – is a foreshadowing of her death. This is the case because it is metal, in the form of the planes, that ‘rattled her trees and flatten[ed] the young canes in her field.’ (Marshall. p.186). This is a physical echo of her emotional response to the knowledge of the existence of the Empire State building. The fact that she is found dead after this incident is not a surprise to the reader.